Learn how to set up 1Password on your computer, tablet, and phone. Before you set up the 1Password apps, you’ll need to sign up for an account. Get 1Password for Mac, install it, and open the app. Click 1Password.com below “Used 1Password before?”, then click “Scan your Setup Code”. Follow the onscreen instructions to find and scan your Setup Code. Need help? Download 1Password on the App Store and open the app. Enter your Master Password and tap Done. Get 1Password for Windows, install it, and open the app. Click “Sign in to 1Password.com” on the welcome screen. Click your account name in the top right and choose Get the Apps. 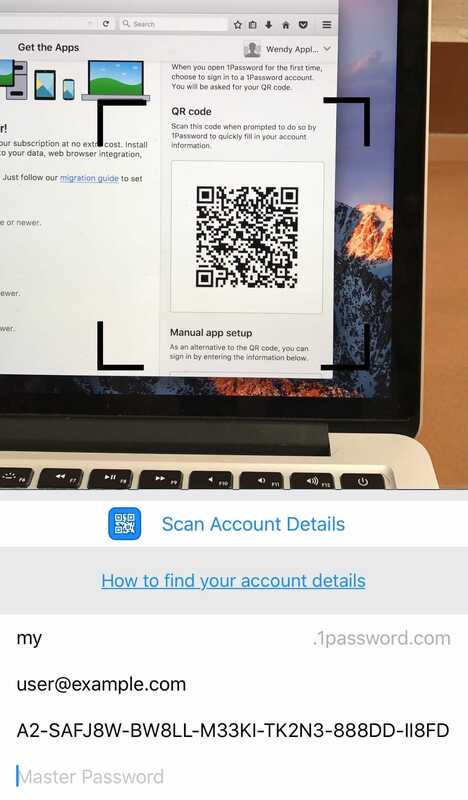 In 1Password, click “Scan your Setup Code” and choose “From my screen”. If you can’t scan your Setup Code, make sure it’s visible when you minimize 1Password. Get help finding your Setup Code or Secret Key. Get 1Password for Android and open the app. Tap 1Password.com, then tap Scan Account Details. Enter your Master Password to sign in.